**International shipping charges are estimated. We will invoice you for the shipping once we can determine the exact cost to your country. Feel free to message us with any questions. The Electron Fuzz “Custom” is an extremely high gain distortion. Seriously, normal volume setting is at about 10% of its full output potential. Two gain/tone controls “Hurt” and “Pain” give a variety of tone textures and a feedback noise loop can be adjusted to add a very gritty almost 8-bit sound or a squelching scream. (Great for droning or well crafted solos and recording). The extra stomp switch adds 2 more additional gain stages and a boost of high end to the sound. Best of all the distortion oscillates when notes are held adding a new level of expression. ***Orders may take 1-2 weeks depending on availability of meters. Here is a great demo video from the “Pedal and Effects” youtube channel featuring Alessandro Cortini of NIN, Sonoio and Modwheelmood. 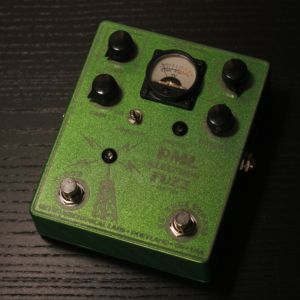 Please read the brief history of the Electron Fuzz here. The red LED on the radio tower switches on when boost mode is enabled. A convent way to know where you are when playing. Hurt: Controls the gain of 3rd gain stage. Lowering the gain will also reduce low end. Pain: Controls the gain of the 2nd transistor gain stage. Lowering the gain will reduce high end. Output: Volume/saturation. Take some of the edge off the mix or crank the pain and hurt all the way for a big, dirty, crunchy fuzz. FB Noise: On/Off adjusts the amount of feedback in the circuit for noise making. Creates a weird octave mod fx. Low cut toggle: Cuts the low end for a slightly less bassy more gated sound. x1000 gain: On left stomp switch. This takes your sound through an addition 2 transistor gain stages and pushes the electrons way past 11! 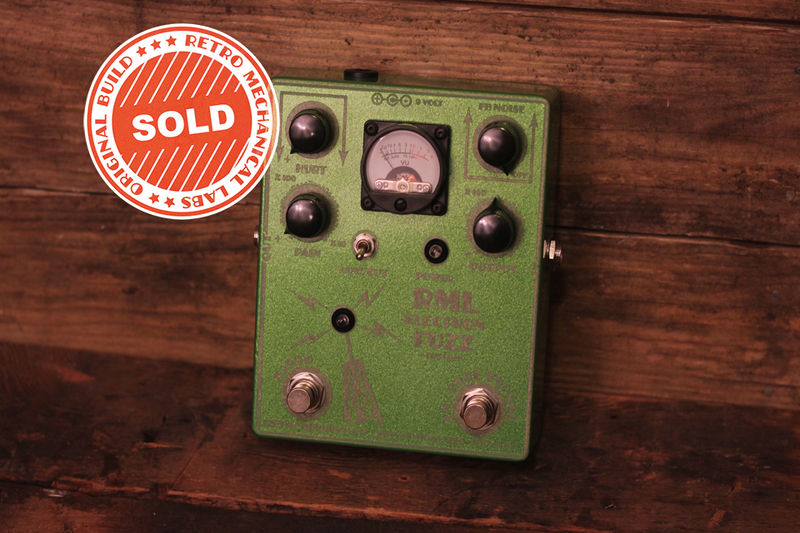 The booster switch adds a loud and dirty, thrash crunch to this versatile pedal. Incredible for feedback noise and FX textures. Can cause the parasitic frequency oscillation but sounds awesome while playing. True Bypass: Lets you play through the pedal. • Meter: Responds to your playing, and reflects first gain stage transistor distortion. Illuminates when active. More info on the Electron Fuzz! ***All purchases done through Paypal. Units are always shipped ASAP. Please note when purchasing from eBay shipping charges may be vary. ****International shipping can vary. Typically I will credit back any difference when your unit is ready and I am able to verify exact shipping to your specific location.